One of the joys of a holiday weekend is actually having enough time to do everything one wants to do and still have time to relax. (Note – this statement mostly applies to childless, non-holiday hosts like myself – results may vary.) This weekend I managed to bake two pies, make snacks, clean the house, spend time with family, go out to dinner, play board games – and still have time to lounge around the house aimlessly. Even aimless lounging requires some energy, however, and so a decadent Sunday breakfast is necessary before getting down to the serious business of nothing much. Lately Mr. Menace and I have been taking advantage of our waffle iron for said Sunday breakfasts, which is a very good thing indeed if we are going to allow it to take up valuable pantry real estate. Over the years I’ve played with various waffle recipes and techniques and I’ve finally found the keeper – right in my old standby cookbook, Mark Bittman’s How to Cook Everything. For too many years I stuck with the super easy, most basic recipe in the book, but recently I decided to try the Rich Buttermilk Waffles variation. 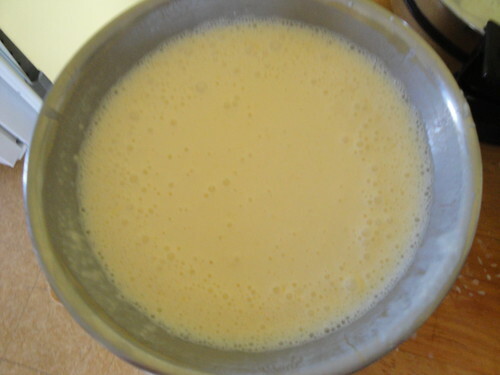 They weren’t even so much more work than easy version – you just need to have buttermilk on hand, although that can even be faked with the old “white vinegar in milk” routine. That said, I’ve now done it both ways and the actual buttermilk variation seems to be a bit fluffier and richer than the fake-out. 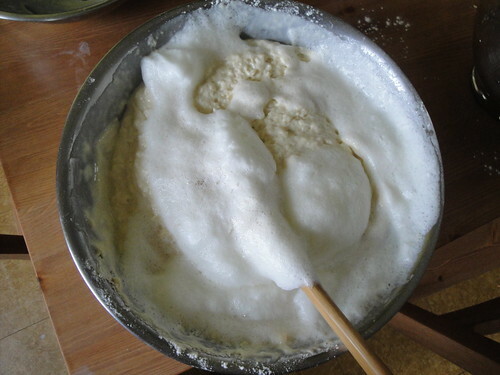 Just some flour, baking soda, salt and sugar. This was a double batch, because Mr. Menace likes to have extra to toast up later. Bittman would consider this sacrilege – he calls waffles “delicate creatures” in the book – but luckily he hasn’t been around to complain. Next the wet ingredients. First you’re gonna separate some eggs. This is the most time-consuming step of the whole process (not so much the separation but WHY you are separating, which you will see in a moment) but I promise that it’s worth it. Sent to separate bowls until they learn to behave! 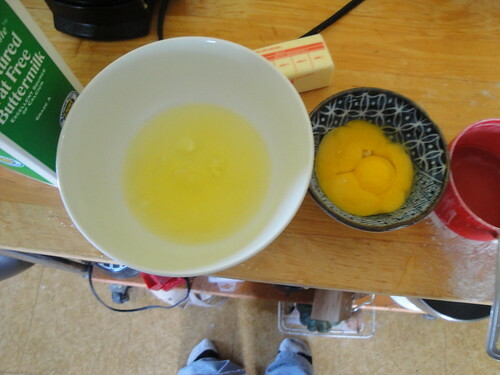 The yolks will get added to the buttermilk and the largish amount of butter that you have previously melted. Don’t freak out too much about the butter. These are rich waffles, after all. Add some vanilla extract if you’re into that, which I am. Just some buttermilk, butter and egg yolks, hanging out in a bowl. Now you need to beat the whites until the hold soft peaks. 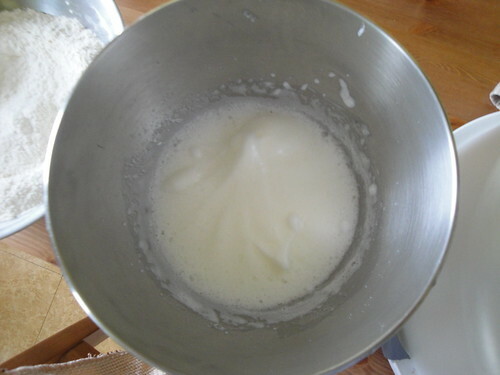 If you’re a masochist, you can do this by hand, as I did the first time, or if you’re sane, you can do it with your stand mixer like I did this time. Maybe that’s REALLY why they were fluffier this time around. This is what a soft peak looks like. 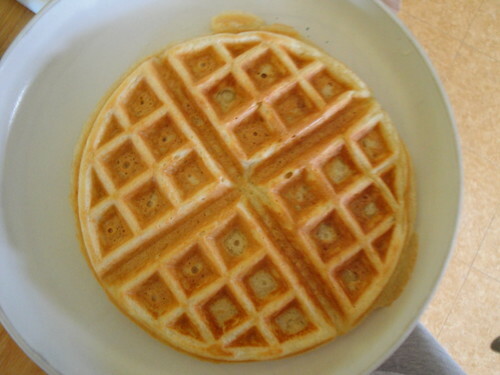 Now you should turn on your waffle iron and brush it with oil, to get it ready. Complete integration achieved! 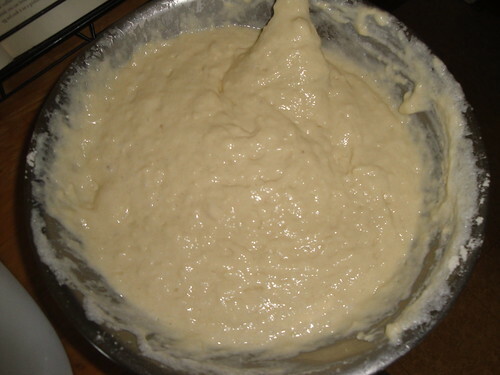 See how fluffy the batter is? This is what 2/3rds of a cup of batter looks like in my waffle iron. TOO MUCH. The first one is always funky. Such is the nature of wafflehood. Now eat them, with plenty of butter and just a bit of syrup, or however you prefer your waffles to be adorned. 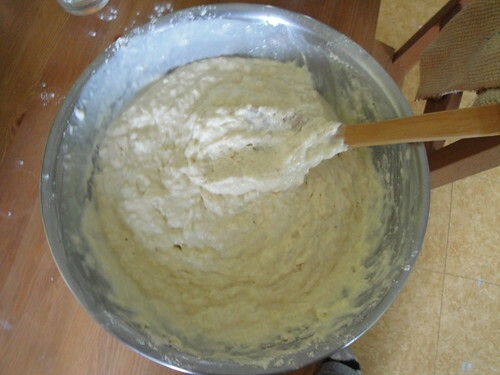 If you’d like the complete recipe with amounts and so forth you can find it here. What’s your favorite Sunday breakfast treat? 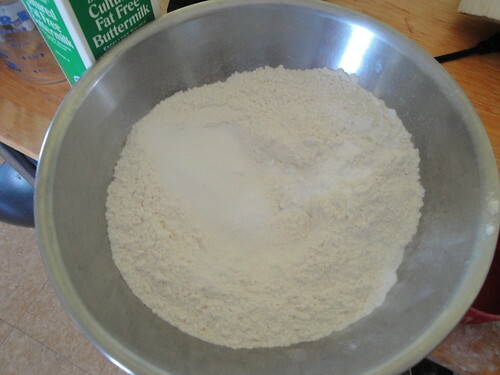 This entry was posted in Food and tagged bittman, breakfast, holidays, homemade, recipe, waffles. Bookmark the permalink. The second waffle looks tasty, however, I’m not a fan of waffles that are hard around the edges. Do you have this problem with yours and if not what is the secret to getting them soft and fluffy, for lack of a better term. This recipe makes a good, fluffy waffle. Hard edges – if I understand what you mean correctly – would come from cooking the waffle too long. You might like these pulled off a bit sooner, say the three minute mark – still golden but less crisp. that looks formidable! 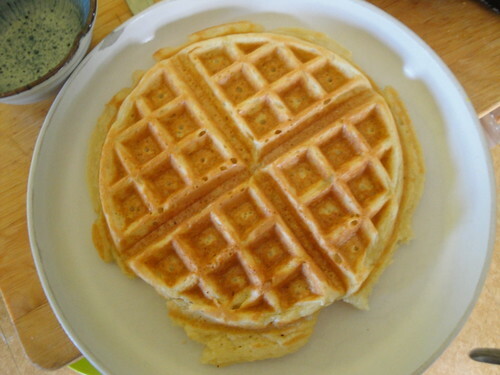 waffles are my favorite breakfast treat and i have yet to try mr. bittman’s buttermilk recipe. NOW I WILL. ohoho, I REALLY REALLY WILL. Thank you Nandi! Eventually we MIGHT try the overnight, yeasted recipe, but I must admit that this makes as close to a perfect waffle as ever I have personally produced. The completist in me, however, yearns to make the comparison.